Bike Helmets: Safety or Fear-Mongering? All the smart people have been saying that campaigns promoting bicycle helmets are so much fear-mongering, that both the dangers of bike riding and the protective value of helmets are exaggerated. One Arlington rider might disagree. A dump truck knocked him down and rolled over his head. He was wearing a helmet and thinks it saved his life. “Yes, there are studies that show that if you fall off a bicycle at a certain speed and hit your head, a helmet can reduce your risk of serious head injury. But such falls off bikes are rare — exceedingly so in mature urban cycling systems. 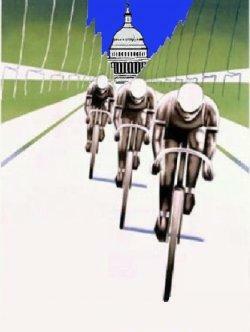 May 20, 2011 is Bike to Work Day in the Nation’s Capital. 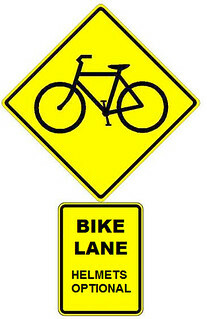 “Bike To Work Day demonstrates the many transportation benefits of bicycling,” US DOT Secretary Ray LaHood, The Fast Lane blog.